Elizabeth took her new wheels for a spin today. She let me have a turn. 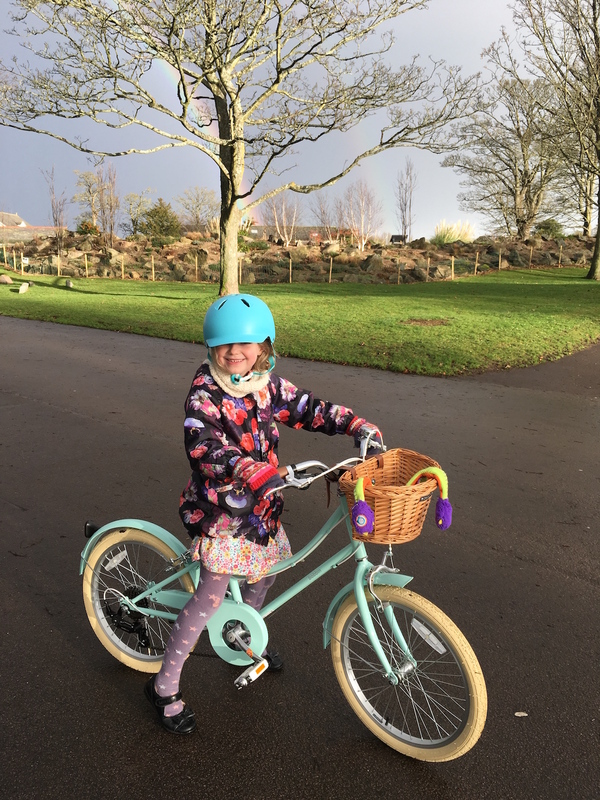 Her new bike is a Bobbin bike and is exactly how a bike should be with mud- and chain guards, a step-through frame, and a basket on the front for carrying things. Without the mud guards she would end up with a black line of dirt and mud all the way up her back. Why would anyone want that? And yet most of the bikes you see in a bike shop today do not have mud guards. I am constantly bewildered by this. The basket provides a receptacle for carrying things – where can you put belongings without the basket? The step-through frame means she can go from walking to cycling and cycling to walking without having to stop the bike. It might be a little while before she’s capable of doing that but it’s something I value greatly on my Dutch bike. It makes cycling more efficient as it allows me to maintain the momentum. A chain guard is also essential as it protects your clothing. It’s Veganuary. Go vegan for January! Five comedians say why you should give it a try in the video below. I can add one more good reason – you can stuff your face as much as you want and not get fat. It’s very hard to be overweight and vegan but you’ve got to make sure you stick with it and avoid dairy products like ice-cream, cream, cheese, and butter. Eat only vegan foods and you can eat as much as you want. Posted in Journal, Vegan and tagged bikes, Bobbin, cycling, diets, food, kids' bikes, Vegan, veganuary. Bookmark the permalink. I would love to experiment more about food. I’m a meat-lover and would never live without meat, but I don’t mind trying something new whenever I can! Yes it would be hard for you! People with plant allergies would find a vegan diet harder to maintain and I don’t think you you should put your health at risk. I eat a lot of lentils and chick peas – can you eat those? I hope Elizabeth enjoys riding her bike and that it becomes a lifelong love for her. It does look a very well designed thing, for the reasons you’ve specified. Thanks! She’s been riding a bike very enthusiastically for a little while now and loves it but the old bike is too small for her.